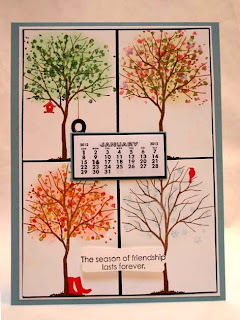 A calendar for the refrigerator with magnet strips on the back. I will include these in my Christmas thank you cards. The mini calendars are from Impress and come 8 to a pack for $3. 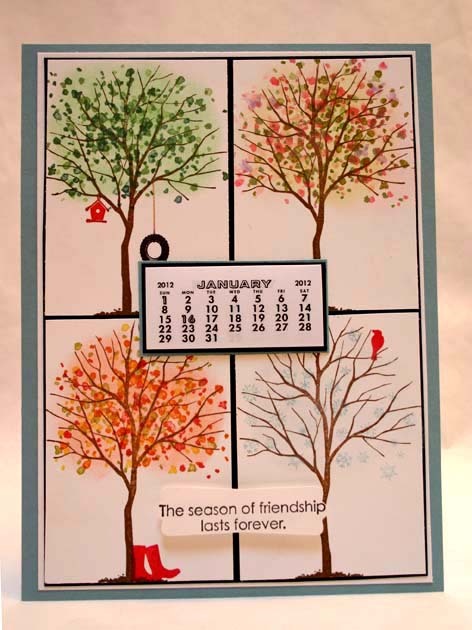 The stamp set is Branch Out and I tried to portray the four seasons with the sentiment from Season of Friendship. Cardstocks of Whisper White, Basic Black, and Baja Breeze. 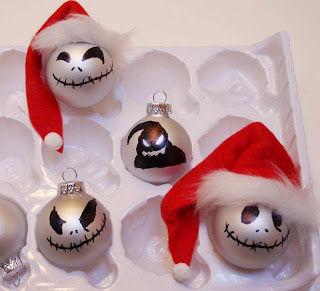 Billy and I made some Jack Skellington ornaments (from The Nightmare Before Christmas) last night using store bought frosted white balls, a black Sharpie, red felt fabric and fur. Billy did all of the artwork. I repurposed a big Kirkland chocolate covered raisins container with SU Candy Cane paper (from last year), gingergread image and red ribbon rosettes. 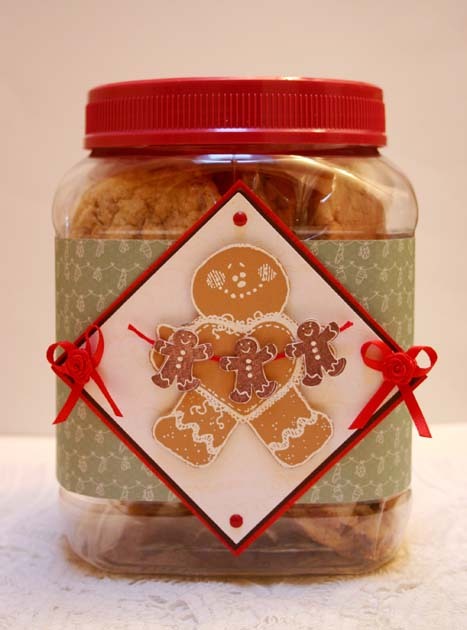 Little gingerbread men are from SU's Holiday Sampler set. I used the snow globe die from Memory Box. I also added Dazzling Diamond to the image and then covered it with an acetate circle to look like glass and then popped up on dimensionals. 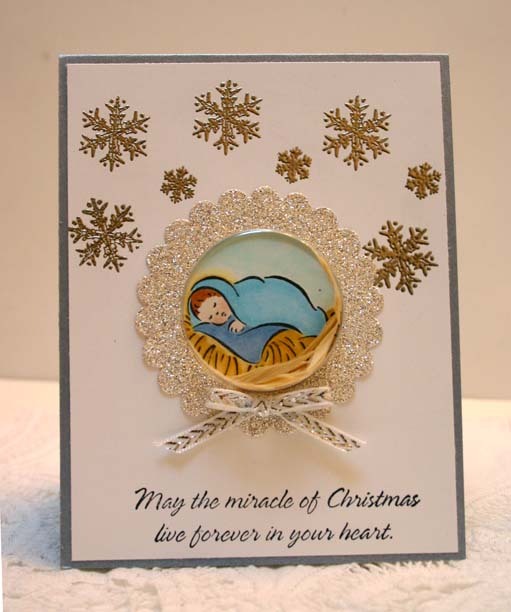 SU supplies of Baja Breeze cardstock, white satin ribbon, Pine Bough wheel embossed in white, glitter paper for sentiment frame. 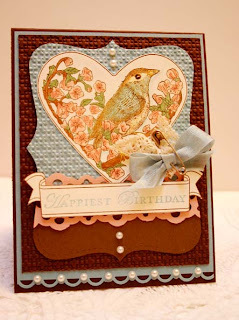 Impression Obsession image colored in markers, Cherry Cobbler and Whisper White cardstocks, sentiment is Warm Words. 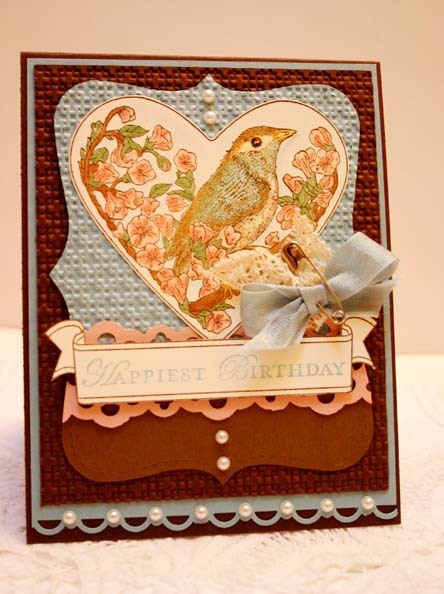 This is a case of a card by Wendy on SCS for the Queen for the day challenge. 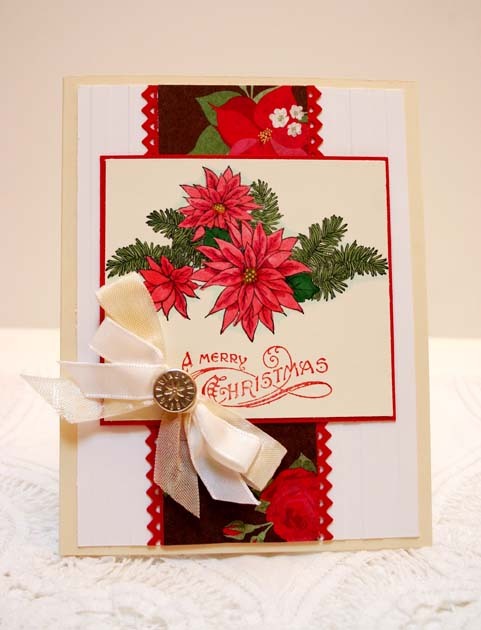 Holly Berry Bouquet paper, cardstocks of Real Red, Whisper White, and Vanilla, silver brad, Stripes embossing folder and heart scallop punch, white taffeta and vanilla seam binding ribbon. This is in honor of the Queen for the day challenge for Nancy Littrell. 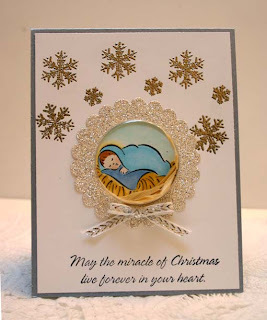 Our Daily Bread ornaments embossed in gold with matching Nestabilities die, Stampin' Up Brushed Gold and Guava cardstocks, and retired SU gold ribbon. Banner is from the new Take it to Heart set. I was talking to my sister last night and she told me that Mom once told her that she never sent out a Christmas card without the baby Jesus on it. I made this especially for her in memory of our Mom, may we never forget the true meaning of Christmas that she taught to us so long ago. The stamp set is SU's Miracle Of Christmas, sweet treat cup has some cut up raffia in it. 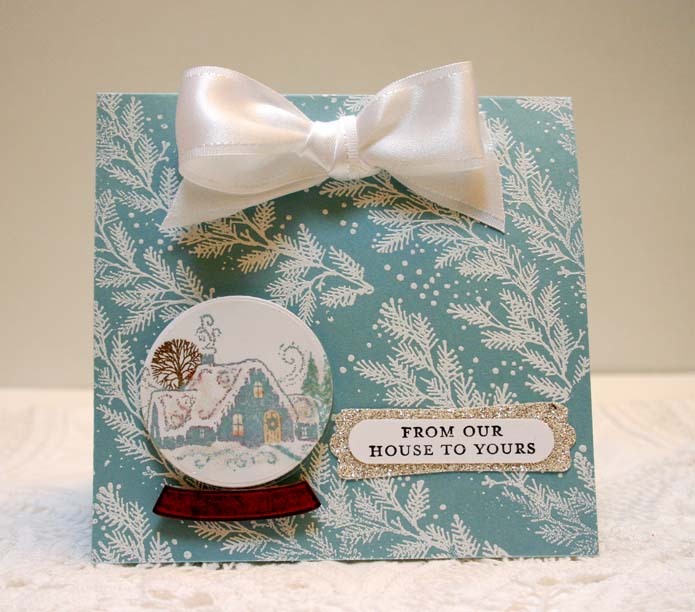 Glitter paper scallop frame and ribbon to embellish. This is a case of Pat Smether's. I thought Starbucks gift cards would be a good idea for teacher's gifts this year. You can't throw a rock around here without hitting a Starbucks, I have two in walking distance. Even if the recipient doesn't like coffee, (say what? 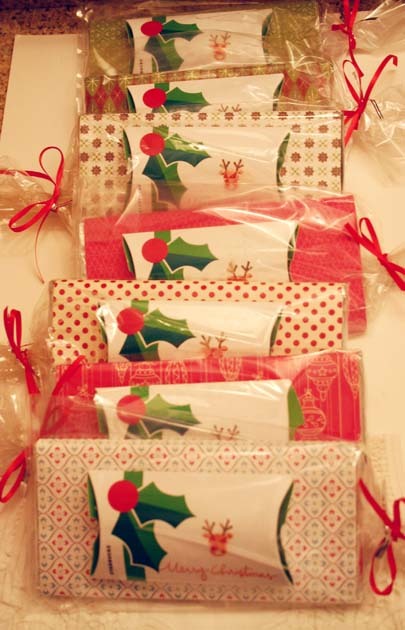 ), there is always tea, cocoa, yummy baked treats, sandwiches, etc. This is a great way to use up the designer paper you all have laying around. Beneath the paper is a jumbo Hershey's Symphony bar. Wrapped in a large cello bag and secured with a tie and red ribbon. The paper strip for the fan fold flower was 3/4"x12" scored at the 1/4 marks. 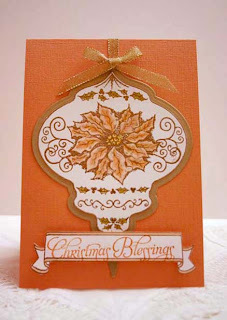 I stamped the Medallion in Artichoke craft ink and then clear embossed on Crumb Cake. 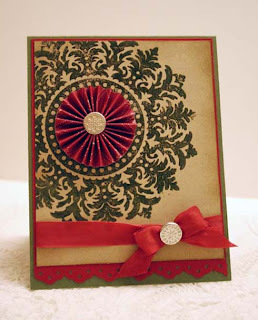 The rosette is made from Nautical Expedition paper with SU brads. Cherry Cobbler ribbon and cardstock on Artichoke base. The stamp set is called Take It To Heart. 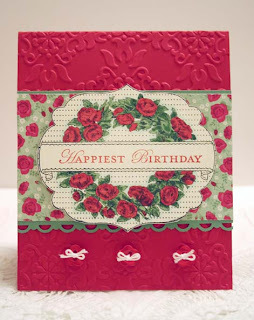 This is a case from the upcoming Stampin' Up Occasions mini catalog. Baja Breeze, Vanilla, and Chocolate Chip cardstocks. All supplies are Stampin' Up except for Nestabilities frame. 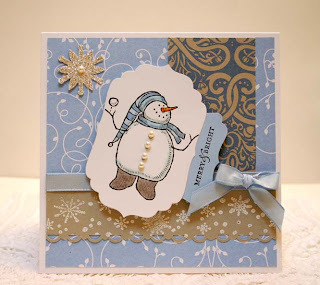 Snow Much Fun snowman, various designer papers, snowflake wheel embossed in white on Sahara Sand. Half pearls to embellish, Bashful Blue taffeta ribbon, SU snowflake from new glitter paper. Handprints, footprints, fingerprints? 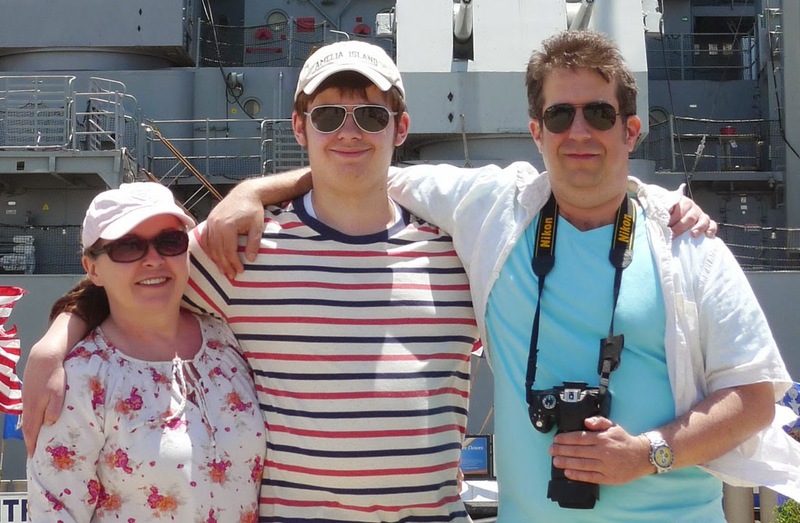 All three! Simply make a tight fist, keeping the pinkie close as you can to the palm and ink the whole side of the the palm/heel and press to paper to make the foot. Fill in the toes with your fingertips with the same ink. 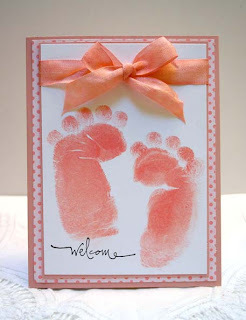 I used Versamark pink grapefruit chalk ink for mine. I know black ink would look more realistic but I wouldn't recommend that since it is so hard to get off of your skin. All other supplies are Stampin' Up. I dyed the very vanilla seam binding ribbon in Blushing Bride ink. 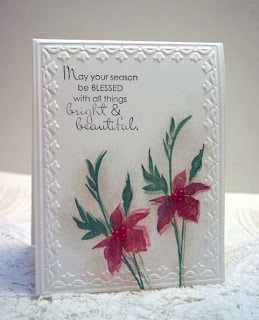 More Virtual Stamp weekend samples. The first card uses Poppy Parade, Chocolate Chip, and Very Vanilla cardstocks. 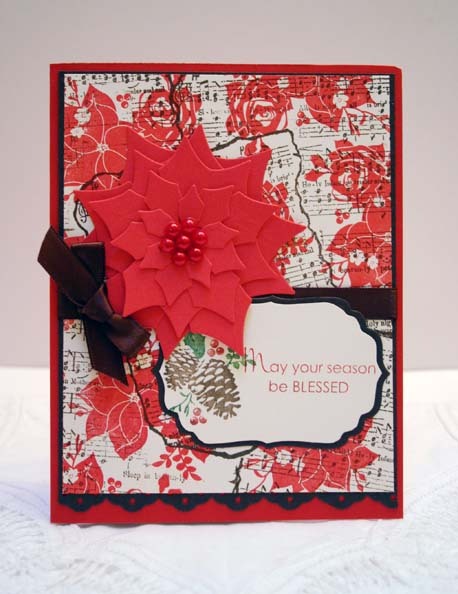 I stamped the sheet music from MFP in chocolate and then the Pines and Poinsettias from SU in Real Red craft. Large poinsettia is from the Spellbinders Nestabilities set. Added chocolate satin ribbon and sentiment label (Beautiful Season). The second card uses the frosted technique, which is a first for me. Not sure I like the result, I'll have to try this a few more times with different color inks. 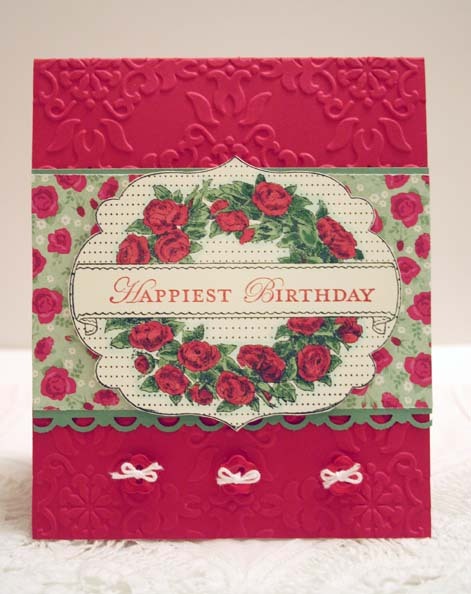 This one uses Fabulous Florets in Ruby and Garden Green sten stamped over in white craft and schmeared ink. Tulips frame embossing folder for edges. 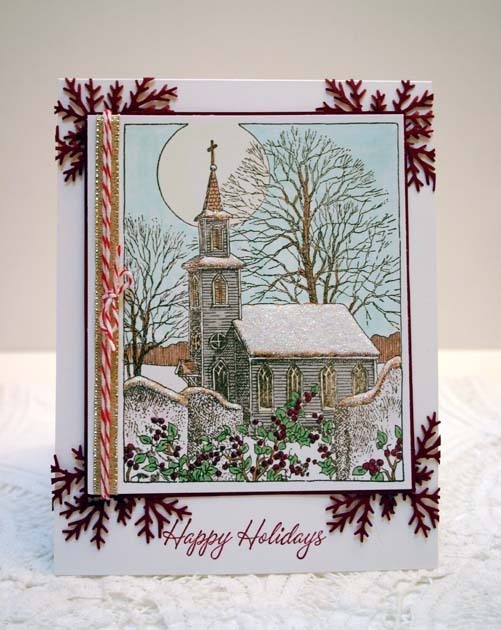 It's Virtual Stamp Night (weekend) at Splitcoast with a theme of Winter Wonderland. 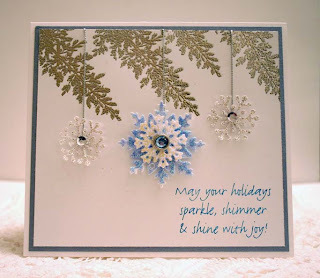 The first card uses the Lovely as a Tree pine embossed in pewter with various snowflake dies and punches. Sentiment is from a retired SU Christmas set (it had triangular retro trees in it, can't remember the name but I use this sentiment a lot this time of year). 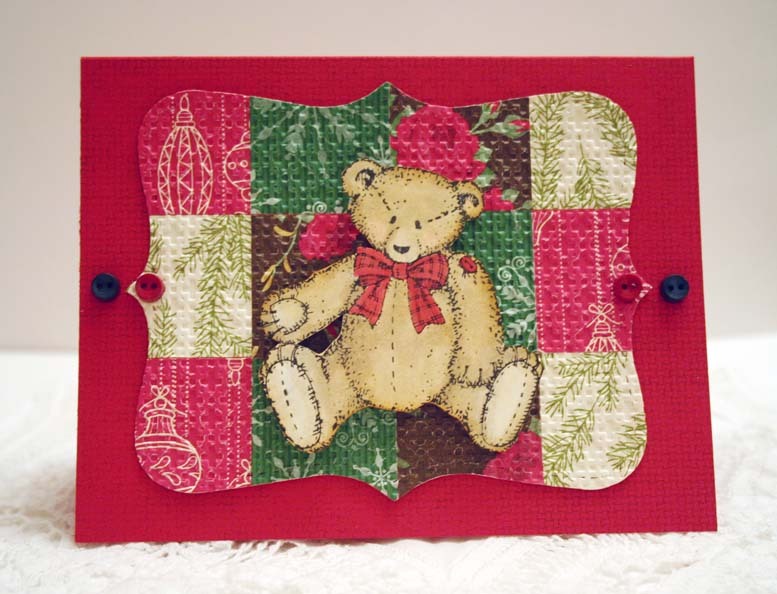 The second card uses the very old SU Button Bear which I like to bring out every few years since he's so cute. I made a "quilt" using the Top Note die and the Lattice Squares embossing folder. 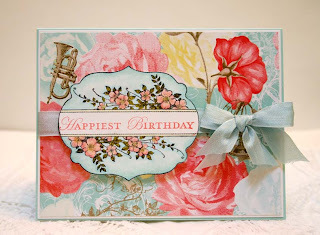 It's hard to go wrong with this lovely new paper from SU- Attic Boutique, if you like the vintage style. 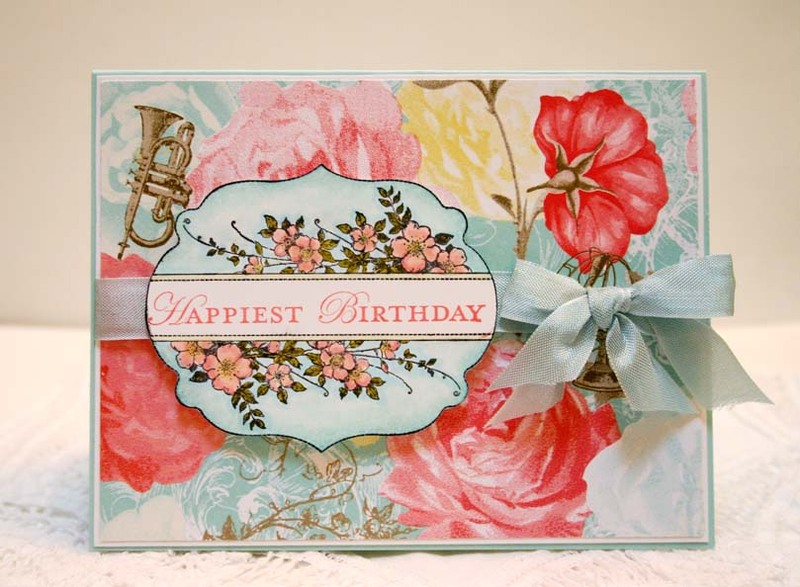 Ribbon is new, Pool Party seam binding style and the stamp set is Apothecary Art. SU also has the coordinating nesting dies for this set. 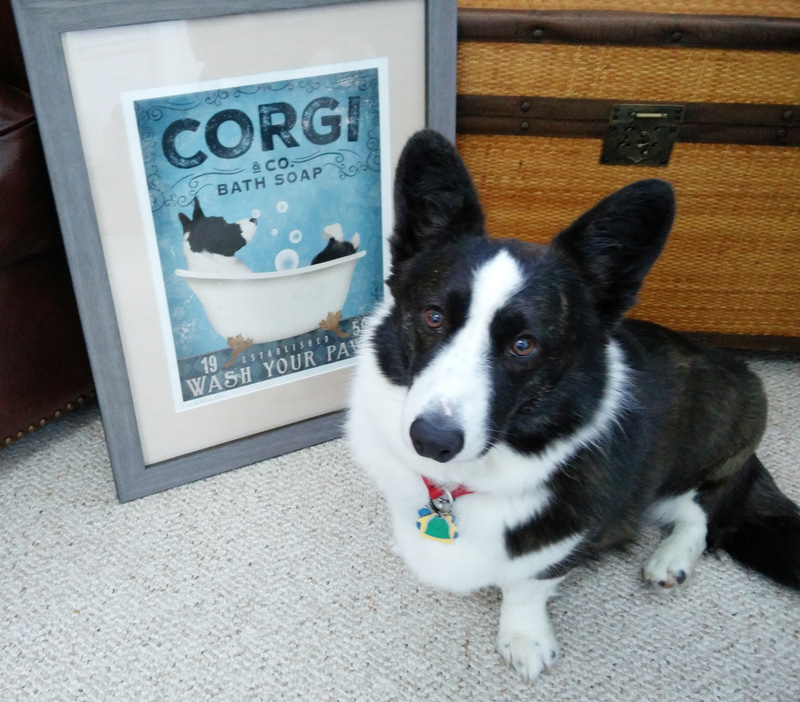 My dreams are coming true, SU will be carrying some nesting frame dies! They have a set that matches this new labels stamp set- Apothecary Art. Such pretty images in this one, I love it! 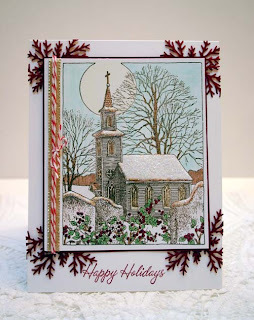 I used it with the Holly Berry Bouquet dsp, perfect for a December birthday. All supplies are Stampin' Up. 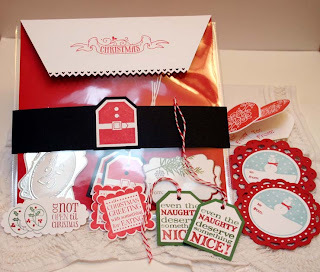 I used a 6"x6" scrapbook page holder for the "envelope" and made up 16 various tags and labels from Tags For Christmas. I started out making a gift tag which turned into a bag. 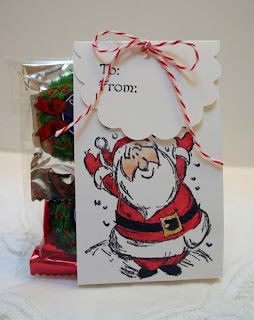 I used the Sizzix bag with scallops die in Whisper White, Jolliest Time of the Year Santa and peppermint patties in a cello bag. Red twine tied to close. Applied gold Smooch accent ink to belt.